Follow me on Pinterest here. What's (p)inspiring you? I love seeing other's pinterests because I am obsessed as well. Loving the pastels thats been inspiring you lately! Love the new look, Krisitna! I love that room in number 2! Gahhh - such gorgeous pins! Dying, love this!! Gorgeous. 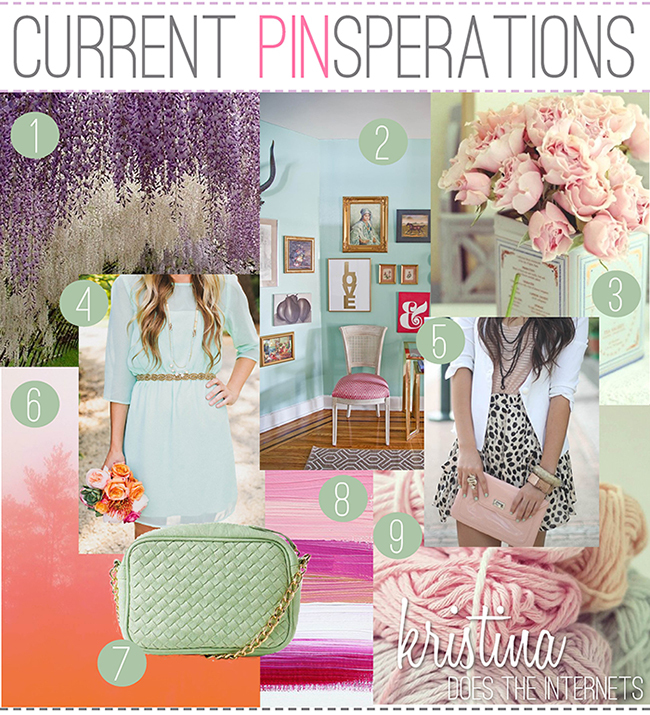 Following of course - pinning is one of my fav things. oh i am SO ready for pastels and their springy goodness! i'm getting so tired of maroon and oxblood. and my favorite color is that robin's egg blue, i'd love to paint a wall like that! Oh, you just made my day! it's so adorable and beautiful! I can't wait for spring to come.already my hand is reaching for all cute dresses and skirts in wardrobe yet it's too cold to wear it all. I am SO ready for spring after seeing all of these pastels! #2 looks like it might be my dream room!